Gelatin is a most versatile protein. This is no more evident than in its use in a wide range of food products prepared in the home. Gelatin based dishes are healthy, nutritious, economic and attractive. Such dishes are much more than traditional jellies and include salads, meats, poultry, seafood, desserts, slices, cheesecakes, ice creams and dressings to name a few. Ms Lourdes Reyes of Mexico is a creative exponent of gelatin in home cuisine. Her website can be visited at www.gelartfloral.com. Ms Reyes has developed her technique of 3D gelatin creations to the status of an art form. This year, a truly superb example of Ms Reyes’ 3D jellos, entitled Sweet Spring Cake (shown right), was a silver finalist at the annual Oklahoma Sugar Art Show at the Tulsa State Fair, where more than 800 cakes were entered in different categories. Click the photo to view a larger image. By arrangement with Ms Reyes, the GMAP website will occasionally feature her creations. The information below outlines the basics. 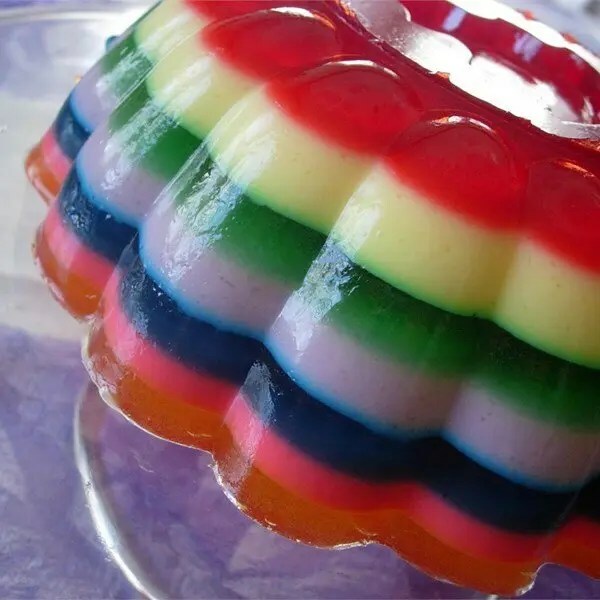 Gelatin is easy to prepare. For the beginner, here are a few tips. Gelatin is usually purchased in a dry powdered (granulated) form. However, it is sometimes available in a dry leaf form. Either form is perfectly satisfactory for domestic use. Prior to dissolving gelatin, it is advisable to hydrate. This initial hydration varies slightly for powdered and leaf gelatin. 1. For the equivalent of each 30 g of gelatin, place it in 125 ml of cold water (½ cup). 2. Allow the gelatin to hydrate for about 5 minutes. 3. Dissolve by pouring the gelatin and cold water into one litre of hot/boiled water. 1. Place the leaves individually in cold water and allow them to swell for about 5 minutes. 2. Remove them and gently squeeze them out. 3. 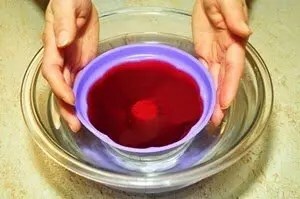 Proceed to dissolve the gelatin in hot/boiled water. To achieve easy blending with ingredients, gelatin must be dissolved in hot water to form a concentrated gel solution. The gel solution will dilute when added to liquids in a recipe. 1. Measure amount of hot water into a measuring jug. 2. Measure required quantity of gelatin and, for speedy absorption, add it immediately to the hot liquid. 3. Briskly beat the hot liquid with a fork or wire whisk. 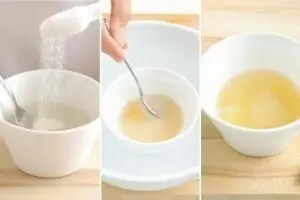 If a recipe is extensive, requiring retention of the solution for a period of time, stand the solution in a bowl of warm water. This procedure can also be used to re-liquefy the solution if it sets before time. 1. Moisten and chill the mould in a refrigerator. 3. Coat the mould by tilting and turning. Chill. 4. Decorate with contents, ensuring they are lukewarm. 5. Spoon remaining gel solution over the contents, according to the recipe. 1. Dip the mould in a bowl of warm water for about 10 seconds. Lightly shake the mould. 2. 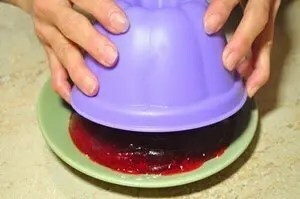 Moisten a chilled serving plate. This allows easy sliding should the contents unmould off-centre. Place the moistened, chilled plate over the mould. 3. Invert the plate and mould, shake gently but well. 4. Carefully lift the mould away. NB: As an aluminium mould is non-porous, the gelled product will leave it more easily than china, glass or plastic. 1. Store gelatin in an airtight container in a cool dry area, free from odours. 2. Fresh pineapple, paw paw and kiwi fruit contain an enzyme that breaks down the gelatin protein. This inhibits the gelatin’s ability to set. These fruits must be heated before adding to a gelatin mix, to disable the enzyme.